Automatically Perform Script on Server | MSN Media. The ability of FileMaker Pro 13 and 14 to perform a script on the server instead of locally on the client’s machine is a huge potential boon for productivity. Tasks for which a user might otherwise have to wait to complete can be accomplished in the background without holding them up. Performing certain scripted tasks on the server is also much, much faster in many cases. 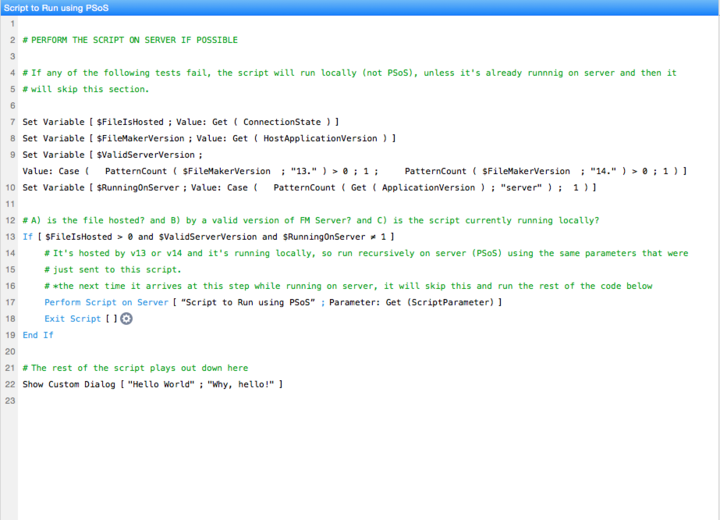 So, it’s nice to perform a script on the server whenever you can. First, the script needs to determine if the file is actually hosted (using Get (ConnectionState) ). Next, it needs to determine what version of FileMaker Server is hosting the file (using Get (HostApplicationVersion) ), and if that version is one that can handle PSoS (using PatternCount to look for the version numbers we require: 13 or 14). Once it’s determined that the file is hosted by a version of FileMaker Server that can use PSoS, the script needs to know whether it is itself currently running on the local machine. If it is, then the script will recursevely call itself again using PSoS. Now the next time it runs (on the server), it will skip to the actual steps of the script we want to perform. If the file is not hosted, or is not hosted by a version 13 or higher server, then it will also skip the steps to call itself via PSoS, and the script just runs the rest of the procedure locally. Just insert some code like this into your script and you’re off and running… on server!